Hana Tropicals is more than a Tropical Flower Farm. 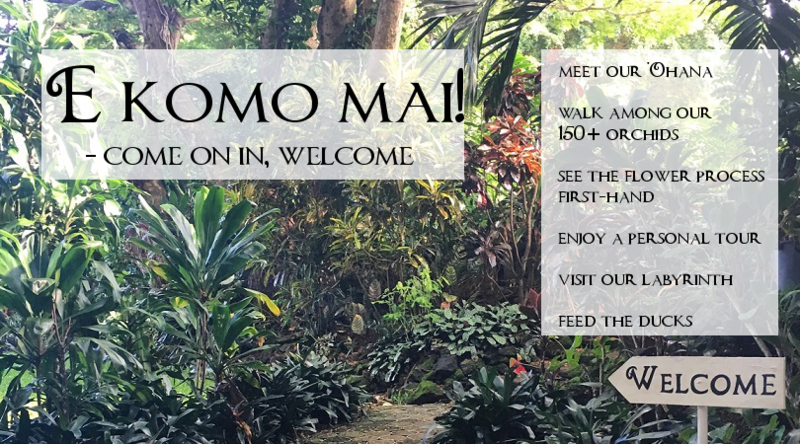 Stop by during your visit to Hana, Maui to have a tour of the farm, see our kiosk filled with handmade gifts and souvenirs, visit with our animals, and meet the team that puts together tropical flower arrangements every day! We are open from 10 a.m. to 4 p.m. every day. Tours of our Tropical Flower Farm are offered on a rolling basis during our business hours (10 a.m. to 4 p.m. daily). When you stop by our farm, you will be greeted by one of our team members for a personal 15 minute tour of our farm and orchid nursery. -See our warehouse where flowers are hand washed in our wash tanks, cut and arranged into various types of arrangements. -Walk through where our flowers are gift wrapped and boxed with aloha and care to arrive on your doorstep two days later. -Visit our touch bucket and have one of our team members show you a few of our favorite flowers hand picked that morning! You'll be able to feel the fuzziness of the heliconia, smell the famous red ginger scent and see how the rattlesnake ginger is the flower form of a snake! -Get close and personal with our wide variety of orchids. Take pictures of your favorite orchid and smell the chocolate orchid. -The tour finishes with a visit to our kiosk filled with handmade local gifts and souvenirs, including our hand-dyed 'I survived the road to Hana Tropicals' t shirts and samples of our moringa tea, honey hand salve and lavender bug spray. -Visit with our ducks, geese and goats if your group is interested! Children can feed the ducks and watch the goats play with each other in their large pen on the edge of the jungle. We look forward to showing you our little slice of Hawaiian paradise!